Widespread in a diversity of habitats; especially characteristic after fire or other disturbance, when seedlings are often abundant. Frequently on dunes and associated with aspen on upland sites, but also in swamps. Usually a relatively short-lived successional tree, growing in attractive clumps from stump sprouts that follow fire. Old trees may persist in the forest, as large as 0.6–1.2 m in diameter, with rough bark. This is a familiar and handsome tree, long famed as the source of birch bark used by Native Americans to construct canoes and other objects. 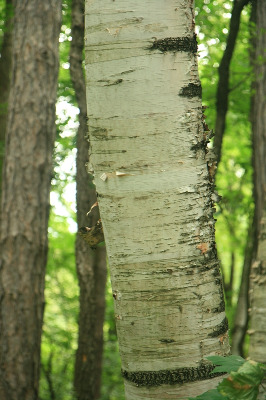 White birch is extremely variable in leaf glandularity and shape and in size, shape, and pubescence of the pistillate scales. Even the bark can be variable, being rich reddish brown on young trunks and even on some older ones being dark or pinkish rather than the usual chalky white. Plants variously referred to B. cordifolia Regel or B. papyrifera var. cordifolia (Regel) Fernald have been regularly reported from Michigan. Betula cordifolia is evidently a northern diploid element (2n = 28 or rarely 56) in contrast to typical B. papyrifera (2n = 70 or 84 or rarely 56). It may be that some trees from northern Michigan are the diploid, but all material we have seen seems to fit best within the variable B. papyrifera. Hybrids with B. pumila are rather frequent and are discussed under that species. MICHIGAN FLORA ONLINE. A. A. Reznicek, E. G. Voss, & B. S. Walters. February 2011. University of Michigan. Web. 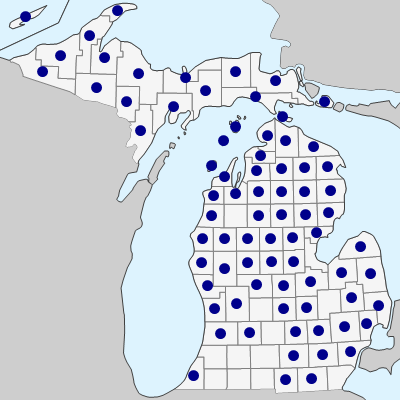 April 26, 2019. https://michiganflora.net/species.aspx?id=551.